Dina and Rafa are a family with passion for Surf, Sea and Nature who created the Douro Surf | Hostel & Surf School to offer them guests not only a tourist trip, but a opportunity to create unique memories in Porto city. Douro Surf provides you a broad set of services such as: Hostel, Surf Classes, Wakeboard session, Stand Up Paddle, Skate lessons, Douro River cruises, Sailboat trip, city tours. Douro Surf Hostel is a building situated in the historical Gaia - which includes the Douro landscape classified as a "World Heritage Site"-, surrounded by Porto Wine Cellars, just 2 minutes walk from the Douro river and the Dom Luis Bridge I. It is a typical Portuguese building, completely renovated with surf soul and decor, relaxed and calm, perfect to chill after visit the city or go out to a party. Our Hostel has great location, there is a Metro, Train, Bus and Taxi Station at less than 5 minutes walking. 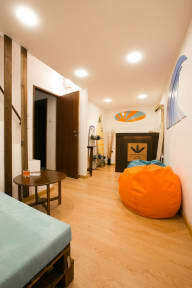 Douro Surf Hostel is a 3 floor building, wich one with private kitchen and wc. We have 3 dorms at all and 1 private room. In all the dorms you will have individual lockers and individual lights. We have also a common room where you can meet and mingle with other guests. We have internet wireless free in every places of the hostel. We have a luggage store where we can keep your luggage for free, even after checking out. 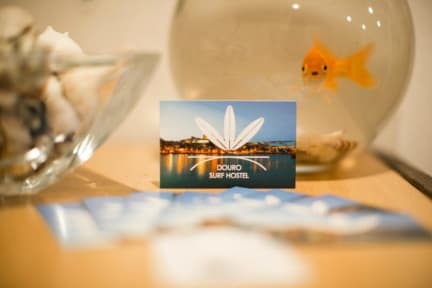 Douro Surf Hostel allows the perfect combination of visit Oporto and go to the beach surfing and chill. - Check out until 12h a.m. Highly recommended! Stayed there for two nights in October, for one night got the whole room just for me. The welcome drink was tasty and they really made sure I knew everything I needed to know about the area. One evening I got back to the hostel, they had done the cleaning and even piled up all my clothes on the bed :) Worth the money! It was an amazing place! The location is great, 5 min from the Ponte Luis I. The hostel is pretty and clean, the beds are very comfortable, the people were great and the staff as well. Dina told me everything that I had to know and visit during the day! Keep up with the great work!! The staff was amazing and so kind! I loved the trip but being able to stay here was amazing and the free breakfast was an unexpected and much-appreciated bonus to the stay! I would highly recommend staying here. I stayed for a week. The location is good and easy to walk around. Luckily they upgraded me from 6 beds to 4 beds dorm, the room was spacious, clean, with the living room & kitchen and also specially with the stunning view thru the window. It made my stay more enjoyable! All of the staffs are very friendly, specially Jessica who always has a big smile and chatting with me when she came in. I definitely will return to stay there and highly recommend to all of u. Very friendly staff and the facilities were excellent! Also the rooms comes with a small kitchen inside where you can cook anything. Just be aware of arriving BEFORE 8 PM!!! You don’t get a real warning by the hostel (any email), just received and email when I was on my way to it (7.10 PM...) I was lucky and arrived just 10’ past 8PM and were some people in the reception. They charge me arbitrarily 5€ for arriving after reception close (this is almost more than 20% of my booking value). The location was really good, staff super positive, helpful and welcoming. The rooms were quite cold during my stay but the heaters were provided. Great place and location, was clean and beds were comfortable. Maybe due to season or otherwise its rather quiet, there are common areas available but for the most still a quieter choice. Staff were extremely friendly and helpful, and the surf lesson was incredible.